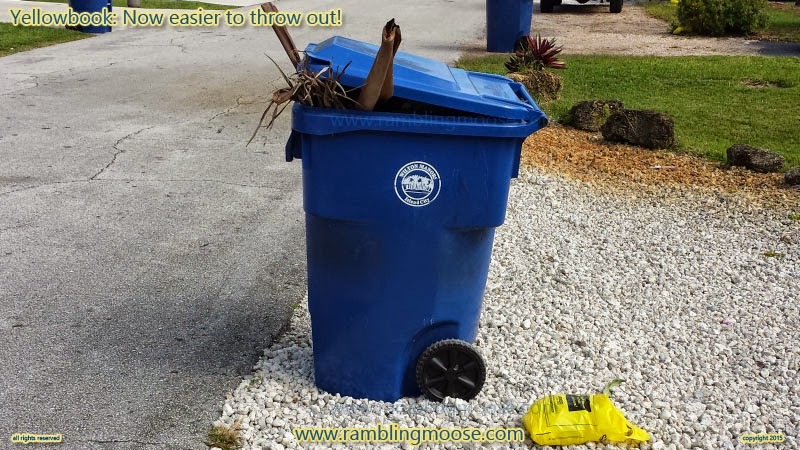 Rambling Moose: Yellowbook: Now Easier To Throw Out! I came home from a workout. Pulling into the driveway I notice some trash by my trashcan as I roll past. Getting my workout gear out of the car, I walk over to the can and just shake my head. It's the annual delivery of trash better known as The Yellowbook. Yellow Pages. Does anyone actually use this anymore? Do we really consult the dead tree directory in this day and age of smartphones, ubiquitous computing, and widespread wifi? I actually use it for one purpose. There is a collection of old phone books under a credenza in the living room. They sit there to block my dog's toys from rolling too far under so he can get them back. I don't have hamsters to chew them up. I don't use them to line the parrot cage. I don't use them to start a fire. I haven't looked inside of one in need of a service in years. Technically speaking, they are litter. I would expect that if a lawyer wanted an easy fee, they could sue for damages or some such insanity. I didn't ask for them. I don't even have a landline. My cellphone is "unlisted", or at least it was a decade ago when I got it as a snowbird. Yes, I wanted a 954 area code when I still lived in Philadelphia. I tried last year to surf https://www.yellowpagesoptout.com but it didn't work. I will opt out again and wonder if in another year I'll come home and they will helpfully put their "publication" next to the trash can so I only have to bend down to bin the stupid thing. The website demands that you register your name, address, and phone number in order to opt out of their trash. I'll make something up later. There is no way on this earth this bunch of fools will get my phone number. A victim of the internet era that still lingers on. Someone please tell the advertisers that their presence in such a publication merely implies that they're not really one of the more technologically savvy of companies. Just for a laugh, even though it was a small one, I turned to the yellowpages section on computers. To prove my point there were three ads for computer services in there. Those would be three companies that I would skip over.